Suzanne West: Can an Energy Company Make Money and Save the Environment? Sometimes, you meet people who change your life, rock your world. 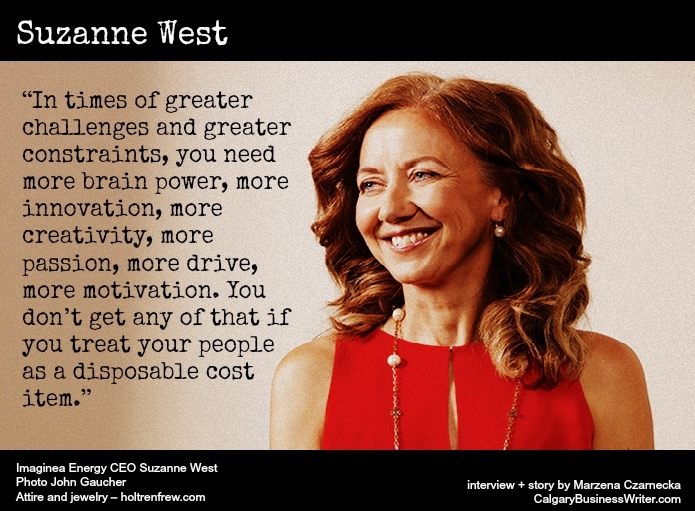 And Imaginea CEO Suzanne West is one of those people. If you don’t know her yet–give her a call, to grab a coffee. Dinner? Better yet, run up and down the Crescent Heights stairs with her for a while. And then, go change the world together. As a preparation for your chat, read my feature, Can an Energy Company Make Money and Save the Environment? (Alberta Oil, August 2015). Full text below, and, of course, in this month’s issue of Alberta Oil. Can an Energy Company Make Money and Save the Environment? 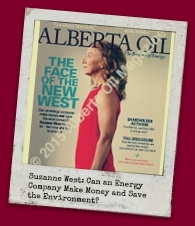 Suzanne West believes that she can build an oil company that’s both sustainable and highly profitable. Is she out to lunch – or on to something huge? That, incidentally, was the same answer she gave when asked if she could raise the $500 million she needed to get Imaginea off the ground at the beginning of 2014. And, she did, starting with a $300-million investment from Lime Rock Partners, a U.S. private equity firm that’s bet on West before. Lime Rock’s investment is perhaps all the endorsement West needs. She went to the firm with her post-Necker Island vision committed to paper, both as her personal manifesto and as an investor pitch. “It is time to pioneer a new kind of 3P energy company,” it said, “one that values Planet, People and Profits equally.” But Lime Rock is a private equity player with one mission: make money. It makes its investment plays with an eye to a profitable exit – that’s all. It gave West money not because she had an awakening and a vision but because she has a track record. She quadrupled the value of her investors’ stakes in Black Shire, and that was after building up and selling both Touchstone Petroleum and then Chariot Energy for very healthy returns. She’s walking that talk, by the way, in the world of sub-$50 oil. Imaginea is not laying off its people. “In times of greater challenges and greater constraints, you need more brain power, more innovation, more creativity, more passion, more drive, more motivation,” she says. “You don’t get any of that if you treat your people as a disposable cost item … If you look at all the great advantages we’ve made in our history, they all happen on the back of human ingenuity. They don’t happen as the result of cost-cutting and layoffs.” That attitude earns West incredible loyalty and devotion from her team. Lindsay Goos, Imaginea’s CFO and vice-president of finance, followed West from Black Shire. “I knew I wanted to be part of her next company,” she says. So did senior geophysicist Jenny Yeremiy, while Munaf Samji, Imaginea’s brand director, gave up a life as a serial entrepreneur for a chance to work with West. Wes Pohl, the company’s creative director, did the same. “There’s this whole starry-eyed and bushy-tailed feeling that she brings back out in you because she shows you this world of possibility,” says Samji. West graduates from the University of Calgary with a BSc in Chemical Engineering. Joins Imperial Oil, where she would work in a variety of roles for almost 10 years. West crosses over to Gulf Canada, where she would spend two-plus years. West re-mortgages her house and does a round of friends-and-family financing in order to found Touchstone Petroleum, a publicly-traded entity that peaked at approximately 280 boe/d before being sold in 2001 to Case Resources. West doesn’t sit on the sidelines for long, and just a few months after the Kareco deal closes she starts another company called Auriga Energy. But this one doesn’t go quite as well as the first two did, and the gas-weighted company runs into a bunch of problems, including a third-party gas plan insolvency that costs Auriga $11 million, a collapse in natural gas prices and creditors who suddenly turned off the taps. In December 2009, West sells Auriga in an all share deal to Orion Oil and Gas valued at $130 million. Undeterred, West gets right back into the game with Black Shire Energy, a private oil and gas company that turned non-core oil assets sold by Cenovus Energy and Penn West Petroleum into almost 7,000 boe/d of production. In October 2013, Twin Butte Energy purchases the company for $358 million in cash and shares deal. Once again, West’s shareholders do very well. West announces the formation of Imaginea Energy. In March 2014, it closes a $300 million investment from Lime Rock Partners – one of West’s private equity backers at Black Shire. I’m based in Calgary, Alberta, Canada. Happy to explore opportunities or possibilities–or just enjoy your stellar company and listen to your story–over a cup of coffee. Shall we say, Vendome, next Tuesday?